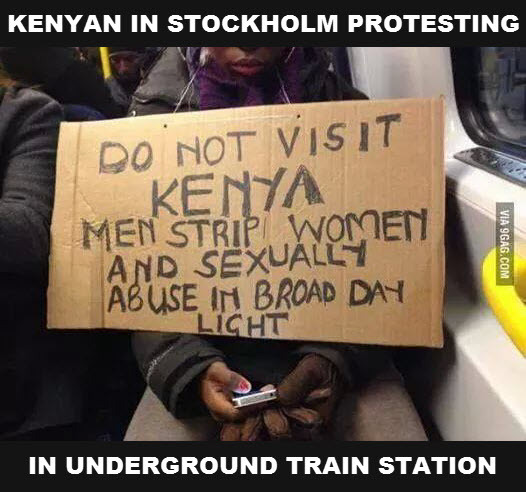 A unidentified Kenyan in Stockholm has today taken the dramatic step of staging a one-woman’s “Placard Protest” in an underground train station. The Kenyan woman hanged a placard on her neck as she sat in the train, much to the consternation of commuters. In her message, she sought to dissuade potential tourists from visiting Kenya following what, she wrote, is the stripping of women and sexual abuse “in broad day light”. She was not immediately available for comment. What is the relevance? Who is your audience? Are you aware there are already more Swedes in Kenya than there are Kenyans in Sweden? Probably not aware that they launched their biggest Embassy worldwide in Kenya too. Moreover, get yourself a lesson or two in grammar.. And perhaps a few more in media and presentation before humiliating yourself with this verbal diarrhoea making you look like a laughing stock. What is it you want? Attention? Then go to your father!